What an interesting intuitive experiment this was. This subject was tough to read and many of you did very well! Those of you who picked up that this woman is royalty were spot on. The lady in the experiment was Empress Dowager Cixi of China. Empress Dowager Cixi was one of the most powerful women in Chinese history. 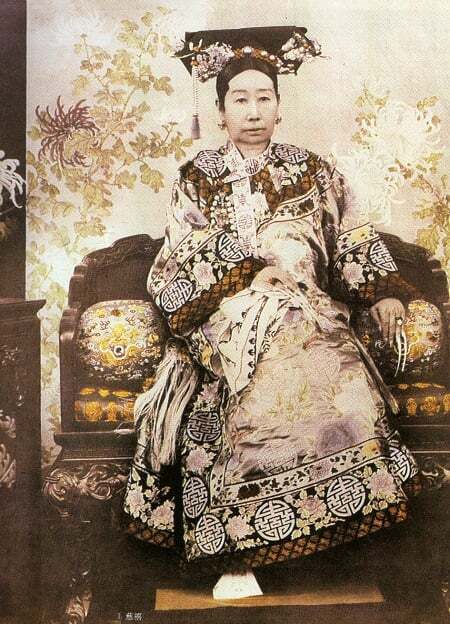 She ruled China from behind the curtains during the Qing Dynasty for 47 years, from 1861 to her death in 1908. There is a very elaborate and complex history during her rule, and while I did not include the entire account here, lots of you picked up on the main points that continue to serve as the subject of debate amongst historians. Was she a compassionate soul, or was she a cold-blooded killer? There is no one unifying account on what kind of person Empress Dowager Cixi was, that is why I chose her for this intuitive experiment. It is interesting to look beyond the historical accounts and read her energy, because energy doesn’t lie. Some of you picked up that she was a geisha or prostitute – that is because when she was 16 years old, the future Empress Dowager Cixi was chosen to join the imperial harem amongst 60 others, where she became a concubine to the Emperor. As destiny would have it, out of all the concubines, she gave birth to the only male, Tongzhi, who would become the future Emperor. Because of that, Cixi rose in rank. It didn’t hurt that her ability to read and write earned the Emperor’s trust, who relied on her judgment on state affairs. After the Emperor died in 1861 at the age of 30, their son Tongzhi was named the Emperor at a mere 5 years old. Empress Dowager Cixi strategized to gain political power. Along the way, she executed those who stood in her way, including regent ministers, party members and prominent officials. She squandered state money on opulent surroundings and jewels. Later on in her life, she even appropriated navy funds to restore her lavish summer palace instead of defending the country during the Sino-Japanese War, causing defeat. Many of you picked up that Empress Dowager Cixi lost her son and that’s correct. Tongzhi was rumoured to have died from smallpox or syphilis. 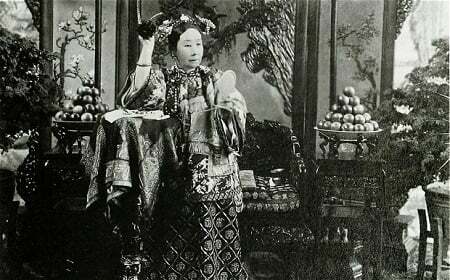 After his death, Empress Dowager Cixi blamed her son’s death on the wife, Jiashun Empress, and even ordered her food portions to be reduced. It is rumoured that Jiashun Empress was pregnant, but she died a few months later, unable to name any heirs. 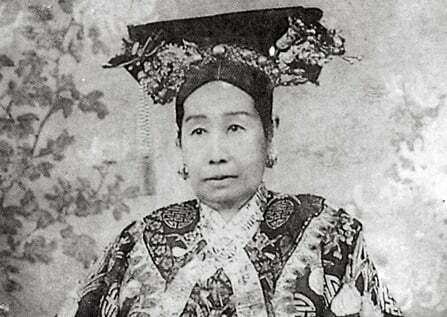 It is suggested that Empress Dowager Cixi drove her to commit suicide. Empress Dowager Cixi then named her 3-year-old nephew to succeed the throne. Shortly after, the Emperor’s mother, Cixi’s sister, also died. Empress Dowager Cixi ruled from behind the curtains from her summer palace. In 1898, she launched a coup against the Emperor’s reform and put him under house arrest. Two years later at the height of the Boxer Rebellion, Empress Dowager Cixi was pushed out of the capital. She fled Beijing dressed as a peasant, traveling in an ox cart. The Eight-Nation Alliance, which included European countries, the US and Japan, sent a conciliatory message to the Empress and she returned to the palace, accepting peace terms. 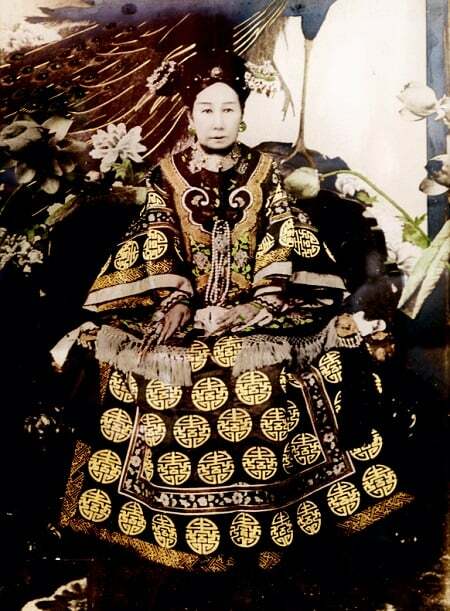 Empress Dowager Cixi died on November 15, 1908, only one day after the death of her nephew Emperor Guangxu. In 2008, a study by Chinese officials confirmed Emperor Guangxu was poisoned with arsenic. CNN reports that the level of arsenic was more than 2,000 times greater than normal. Many of you described the woman in the photo as violent, manipulative, cold, evil, cruel, responsible for the deaths of many and someone not to be crossed. There are also many of you who saw her as a compassionate woman. When I tune into her aura, I feel that there was a contradiction in her personality. I feel that she sees things and people as either “all good” or “all bad” and she responds accordingly in two very different ways. She is very black and white, and comes from her damaged emotional side in her judgements about people. She can be ruthless and violent, and she can also be generous and compassionate, but I do not feel that she is acting from her heart chakra in those moments. I feel that she empathises with people who are in a victim role because of what she once suffered. She is irrational and dangerous to be around because she behaves unconsciously and destructively. Those of you who said she is closed off and guarded were on point. The first thing I felt when I tuned into her (using a technique I teach in my Intuitive Awakening course), was her energy pushing mine away. In that lifetime, she did not want to be looked at; she kept people at an emotional distance. She does not trust and she is emotionally damaged. Some people picked up that she had a lot of masculine energy. She was a woman in a man’s position. Because women were not allowed to participate in state affairs, Empress Dowager Cixi actually ruled literally from behind a screen, never in the open. Many of you picked up on this. Some of you mentioned that she was a leader of women’s rights. The just-published biography, Empress Dowager Cixi paints a very different picture of her, as someone who launched women’s liberation in China. I hope you enjoyed the experiment and learned something from it. If you had any questions or comments about your process or results, please leave a comment. 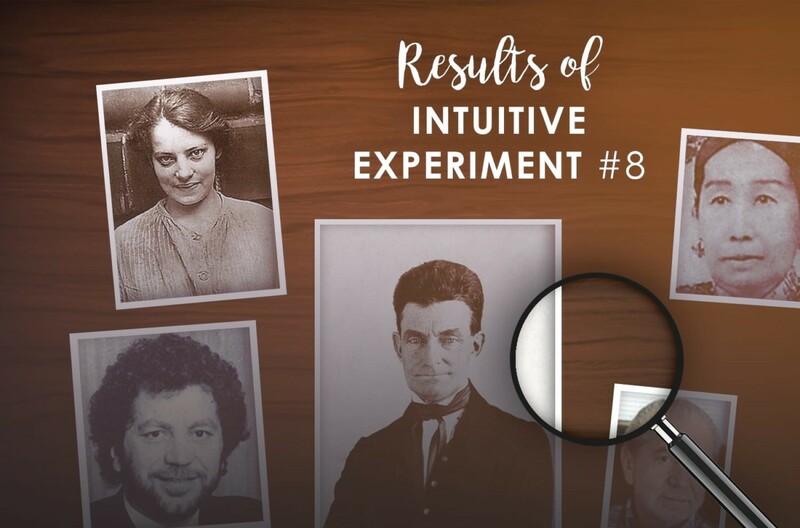 Want To Do Another Intuitive Experiment? Move on to experiment #9! If you would like processes and instructions for developing your intuitive abilities further (including processes to get into the right state of mind to receive accurate information + a solid technique to read auras) then you might consider my Intuitive Awakening course. Wouldn’t it be better if I could have just learned all of this stuff in one place, and in a shorter period of time, instead of over years, searching for the pieces of the puzzle? You can read some reviews here. In my original reading I got that she was angry that she wasn’t getting what she deserved and wanted to get even. So it does make sense why she ended up an Empress to sort of make up her bad childhood. Plus I got the similar reading of anxiousness and that she thinks people are out to get her which can be interpreted as a “closed off” energy. This was a fun exercise! I did this exercise when it was posted, but I didn’t post my impressions because I was so impatient that I had to look her up online right away, based on my impressions, and since I found her very easily and then knew who she was and how close I was in my reading, I decided not to post yet. So, when I first looked at the picture, I got an impression that she was a actually a man. Then I got “China” and “emperor” which led to “emperor’s wife” and “empress” as I wasn’t convinced that she actually was a man, but I did sense some kind of masculine trait in her. I felt that she was sad, and that she was strong and unyielding to men and that she was an advocate for women’s issues, despite the resistance that she was getting. Then I got the word guillotine, and I thought that maybe she was a witch and got killed in a guillotine, but now that I have read through various articles about her, it sounds like she was actually the one doing beheadings, and there seems to be a movie called “Guillotines” that actually is about her husband! Or so it seems, I didn’t spend too much time looking into the movie. I also got that she has secrets. Then I got impatient and googled “Chinese emperor’s wives” and some other versions of it “Chinese empress” and so on. I found her within a couple of minutes!! I didn’t leave a comment before but what came to me was she was distant, tricky, and not to be trusted. It only came from a feeling but the more I thought about her, the more I wanted to not engage in the experiment. These are great. Thanks. I felt I did very well on this exercise. As soon as I saw this picture. I heard the imperial dynasty. So I felt she was a royal. She seemed full of herself and rigid and very self-controlled as well as controlling. Thanks for posting these experiments. Question for Anna and visitors to this site: Do any of you have a hard time wanting to read photos of people you intuitively dislike? I thought her photos fascinating, but I didn’t want to spend more than a few seconds reading them intuitively. I think it’s because I read her as someone who abused her power rather than someone who was supportive of people she liked. Thank you for a chance to practice my abilities. ** Funny thing, I recall you had mentioned something about what may seem familiar or that we could maybe relate to ourselves or someone else. I kept getting that she was holding back from expressing herself as she was fearful of revealing someone else’s lies and wrongdoings. There was something about how her head was down and her eyes were not exactly looking up as in looking someone in the eye. At first, I thought I was seeing a similarity between her and a student of mine who is often nervous about speaking out and keeps his head slightly down and cautiously looks up. Later on, I realized that her pose (and her hairstyle) were similar to a picture of myself when I was around 4 years old. I was very shy, and adults around me were always telling me not to speak as in “don’t repeat our business to anyone.” Obviously this woman had a lot to hide even though she couldn’t avoid being photographed. I took a quick peak at this womans pictures(a few days ago) and had meant to come back and post. I’ll share here. The first thing that came to me was the word “tyrant” LOL I had to look up the meaning. I also got the feeling she was an authority figure, a leader, but I didn’t think it was something as big as an Emperess. I also picked up on her masculinity, to the point of wondering if this was another male posing as a female. When I asked the question “could I trust this person” I drew a blank. I had no feeling one way or the other. At this point I felt she was very guarded (with her feelings)and then I started to get the feeling this wasn’t someone you would sit down with and have a cup of tea and friendly conversation. I asked her if she had anything she wanted to share with me and again…nothing. So I’m not suprised to see she was hard to read. Thanks Anna for these experiments and for taking the time to share the results. I’m surprised at how often my “take” is expressed with your first few sentences of explanation. I don’t usually get specifics, but hunches about the person. In the case of Cixi, I was getting such mixed signals that I finally gave up. Her eyes express more of an innocence, but the lower part of her face has more potential for cruelty. That may not be as much “psychic” as just face-reading. But intuitively, the signals remained mixed. Definitely felt like someone with power, possibly royalty. And you’ll laugh, but I was thinking she might be a “Madam.” Since she headed a harem at one point, that’s close. I even looked up Madame Chiang Kai-Shek for a picture. Wasn’t her, but the Wiki link you provided said that possibly the pearl in Cixi’s corpse’s mouth ended up on the shoe of the Madame. Crazy! Your lesson definitely shows the truth that some humans have the potential for both great spiritual heights and depths. Me too!! I love them. Please them more often!!! I just looked at her picture in my email this morning and was surprised reading her bio afterwards. She didn’t strike me as evil, just conflicted and somewhat childish. She suffered a lot in her life. She was overlooked. I knew she was an empress, and Chinese. I didn’t pick up on the concubine, I did pick up her lack of trust in everyone around her. I picked up on her being a complicated person with a lot of personal sorrow who made many difficult choices in her life. A lot of what she did was for her own protection, as she was aware she was always in danger of being replaced/disowned/disposed, She may have been deeply paranoid in life. She didn’t make any of her choices from her heart, it was cold rationality in her mind. Survival instinct almost. She was aloof but she deeply desired being important to someone/everyone somehow. She decided if she couldn’t be loved, she would be feared. An iron fist in a velvet glove comes to mind. She has a child-like presence due to her underdeveloped emotions, she seems to lack rational thinking like a child would. She has an air of sophistication that seems forced, like she is trying to emulate something she wasn’t. The masculine presence is evident in her face, and she either came from poverty or was not treated well, a hard life. I’m going in circles. She did what she thought she had to, to survive and still get what she wanted. Now to read what everyone else said 😀 And thank you for the challenge! It is like a puzzle or riddle, and the more you concentrate on it, the more it unfolds. I didn’t get a chance to study the picture after the first day it was sent out, but the immediate responses from my voices were that she was mean, powerful, hard handed, and sometimes cruel. I just got that “don’t mess with me” vibe. I didn’t get anything positive from her at all! My third eye went nuts! I’m loving the experiments. Makes my whole forehead tingly all the way across! Please keep them coming!Thanks Anna!